Meanwhile, line a baking sheet with aluminum foil. Place bacon in 1 layer on foil. Bake for 15 minutes, or until bacon just begins to turn brown. Remove pan from oven and carefully drain grease. Brush the bacon slices with the reduced Coca-Cola. Return bacon to oven and bake for 3 minutes. Remove pan and brush bacon again with the reduced Coca-Cola. Return bacon to oven and bake for 3-5 more minutes, or until bacon is fully cooked. Brush bacon once again with the reduced Coca-Cola. Transfer bacon from pan to a plate; set aside until bacon has cooled. Cut bacon into small pieces; set aside. Using a medium sauté pan, add butter and place over medium-low heat. Once butter has melted, add flour and cumin. Cook, stirring constantly, for 1 minute. Add milk, shredded Monterey Jack and shredded cheddar. Continue cooking for 4-5 more minutes, or until mixture thickens and cheese is fully melted. Remove mixture from heat and stir in sour cream. 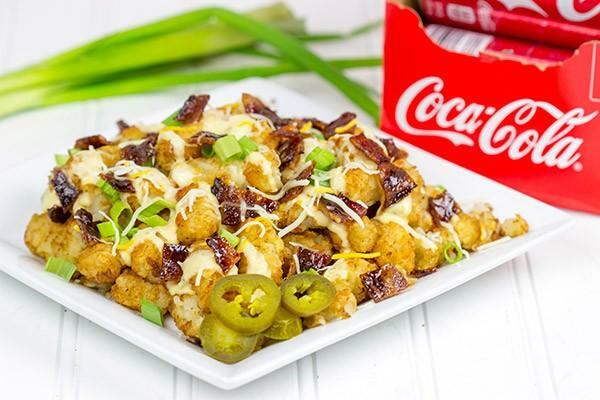 Place tater tots on a large plate and top with pickled jalapenos, shredded cheese and green onions. Drizzle Queso over the top of the tater tops. 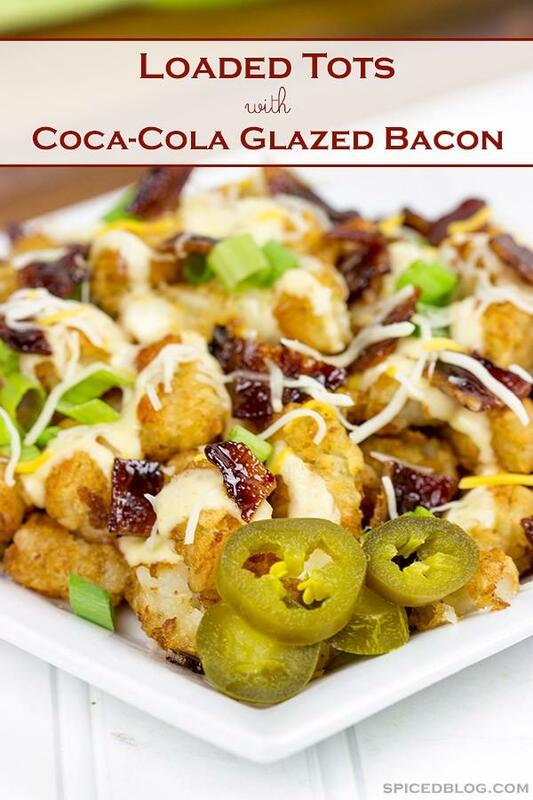 Sprinkle with crumbled Coca-Cola Glazed Bacon.